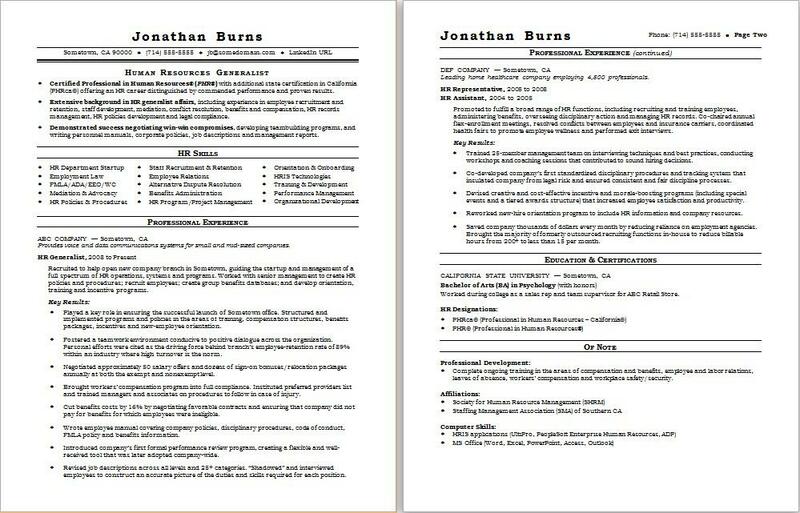 Use these tips to write a human resources resume. The job of a human resources generalist includes the implementation of programs and services such as talent acquisition, staffing, employment processing, health and welfare benefits, and more. To make sure your resume best represents all of these skills, view the sample resume below, or download the human resources generalist resume template. If you need additional writing tips, join Monster today, so the experts at Monster's Resume Writing Service can help you impress employers with a high-impact resume for jobs in software engineering. Certified Professional in Human Resources® (PHR®) with additional state certification in California (PHRca®) offering an HR career distinguished by commended performance and proven results. Extensive background in HR generalist affairs, including experience in employee recruitment and retention, staff development, mediation, conflict resolution, benefits and compensation, HR records management, HR policies development and legal compliance. Demonstrated success negotiating win-win compromises, developing teambuilding programs, and writing personnel manuals, corporate policies, job descriptions and management reports. Recruited to help open new company branch in Sometown, guiding the startup and management of a full spectrum of HR operations, systems and programs. Worked with senior management to create HR policies and procedures; recruit employees; create group benefits databases; and develop orientation, training and incentive programs. Played a key role in ensuring the successful launch of Sometown office. Structured and implemented programs and policies in the areas of training, compensation structures, benefits packages, incentives and new-employee orientation. Fostered a teamwork environment conducive to positive dialogue across the organization. Personal efforts were cited as the driving force behind branch’s employee-retention rate of 89% within an industry where high turnover is the norm. Negotiated approximately 50 salary offers and dozens of sign-on bonuses/relocation packages annually at both the exempt and nonexempt level. Brought workers’ compensation program into full compliance. Instituted preferred providers list and trained managers and associates on procedures to follow in case of injury. Cut benefits costs by 16% by negotiating favorable contracts and ensuring that company did not pay for benefits for which employees were ineligible. Wrote employee manual covering company policies, disciplinary procedures, code of conduct, FMLA policy and benefits information. Introduced company’s first formal performance review program, creating a flexible and well-received tool that was later adopted company-wide. Revised job descriptions across all levels and 25+ categories. “Shadowed” and interviewed employees to construct an accurate picture of the duties and skills required for each position. Trained 25-member management team on interviewing techniques and best practices, conducting workshops and coaching sessions that contributed to sound hiring decisions. Co-developed company’s first standardized disciplinary procedures and tracking system that insulated company from legal risk and ensured consistent and fair discipline processes. Devised creative and cost-effective incentive and morale-boosting programs (including special events and a tiered awards structure) that increased employee satisfaction and productivity. Reworked new-hire orientation program to include HR information and company resources. Saved company thousands of dollars every month by reducing reliance on employment agencies. Brought the majority of formerly outsourced recruiting functions in-house to reduce billable hours from 200+ to less than 15 per month. Worked during college as a sales rep and team supervisor for ABC Retail Store. Complete ongoing training in the areas of compensation and benefits, employee and labor relations, leaves of absence, workers’ compensation and workplace safety/security.